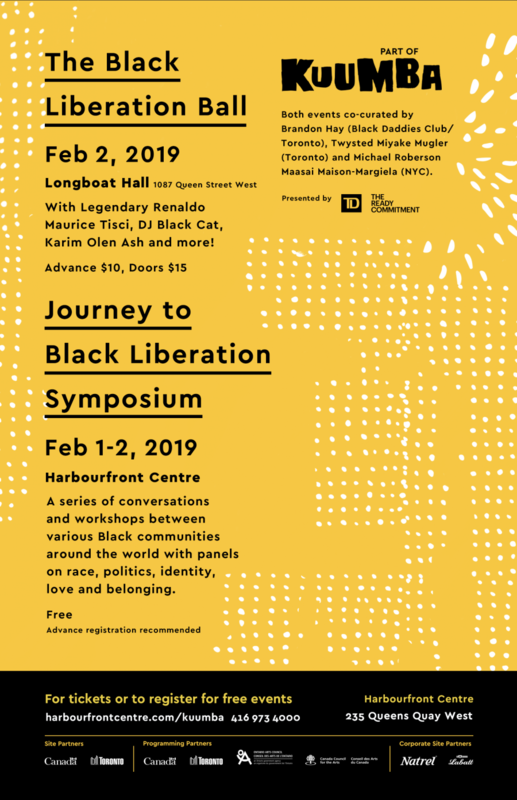 The Journey to Black Liberation Symposiumand Black Liberation Ball, is taking place this weekend February 1stand 2nd, 2019. A part of Kuumba Black History Month festival at Harbourfront Centre. Register today and get your free tickets. Online registration for the symposium will be closed on February 1st, and then it will only be registration available on the day of the event at the venue. Toronto District School Board (TDSB) partners with the Journey to Black Liberation Symposium to bring youth led plenaries on Toxic Masculinity and Homophobia; and Police brutality. Creating an intergenerational learning space is important to the organizers of the Journey to Black Liberation Symposium and we are excited to partner with some awesome young people from Downsview High School (TDSB), who have co-created the Black Brilliance conference, which have been successful for the past three years. These youth led panel discussions will take place on Friday February 1st, 2019 from 10m to 2pm, this will be youth led and youth only space, teachers and guardians are welcomed. Lunch will be provided, to register your students, email cguespin@harbourfrontcentre.com. OCAD University partners with the Journey to Black Liberation Symposium, Black students from OCAD, will be showing some dope artwork that speaks to the idea of Black Liberation during the symposium on February 1stand 2nd, 2019, these artwork will only be shown over this weekend, please come out and check out these great art pieces. HuffPost Canada features Black Daddies Club and WeSpeak barbershop session on January 25th, 2019 at Hairplay Salon, the topic was on Honesty in Black relationships in Toronto, and the discussion was a primer for the bigger conversation taking place at Harbourfront Centre on February 2nd, 2019. CTV The Social will feature two of the three co-curators of the Journey to Black Liberation Symposium and Black Liberation Ball. Twysted Mugler and Brandon Hay, will be featured on the live TV show on Friday February 1st, 2019 at 1pm, Get your PVR ready. Previous PostAnnouncing the headliner guest for Journey to Black Liberation Symposium and Black Liberation Ball Feb 1st and 2nd, 2019 at Harbourfront CentreNext PostCTV The Social discusses Black Masculinities, the Journey to Black Liberation Symposium and the Black Liberation Ball.